Dr. H. M. Baagil's Muslim Christian Dialogue is a proselytic tract that sets forth Islam's primary charges against Christianity: the corruption of Scriptures revealed to earlier prophets and the adoption of false and idolatrous doctrine. Dr. Baagil's treatise has been used by countless Islamic organizations to urge Christians to return to the pure, authentic, uncorrupted religion of Islam. At last… -there is now an answer to Dr. Baagil's treatise. In this volume, A. Yousef Al-Katib sets forth a systemic reply to each of Dr. Baagil's attacks on Christianity. 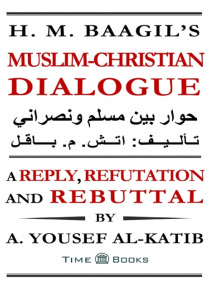 A. Yousef Al-Katib, himself a Christian convert who spent more than five years in religious study before experiencing the miraculous power of Jesus to heal and to save, thoroughly replies to, refutes and rebuts each of Dr. Baagil's arguments on a detailed point-by-point basis. He reveals Dr. Baagil's innumerable contradictions, false statements, circular arguments, illogicisms and erroneous biblical interpretations.